…but what do I buy for the baby? This is a Mei Tai. It is not a Mai Tai (but you might need that too). It is one piece of cloth that you can wrap and tie into various devices to carry the baby. It has no hooks, snaps, or velcro to mess with. You just tie. That also means different people can wear it and it is not “sized” for one person. It is easy to wash. Babies are messy. This is fabric. Throw it in the washing machine. Done. It is versatile. We often used this to tie Baby G to a high chair in Asia, or to carry misc. stuff from the car. It keeps the baby close. This is my favorite. All three of my kiddos practically lived on my chest. G spent the first 12 months of her life sleeping on daddy. You can see and hear them sleeping and you can check in a moments notice. It goes everywhere. You just stuff it in a suitcase or baby bag and away you go. Lu and I walked all over Belgium just tied together. This is a “rocker.” When the baby is first born you are going to want to have him/her right next to momma. It beats getting up and going to another room. It is also MUCH easier on the mother to just roll over, grab the baby, feed, and go back to sleep. 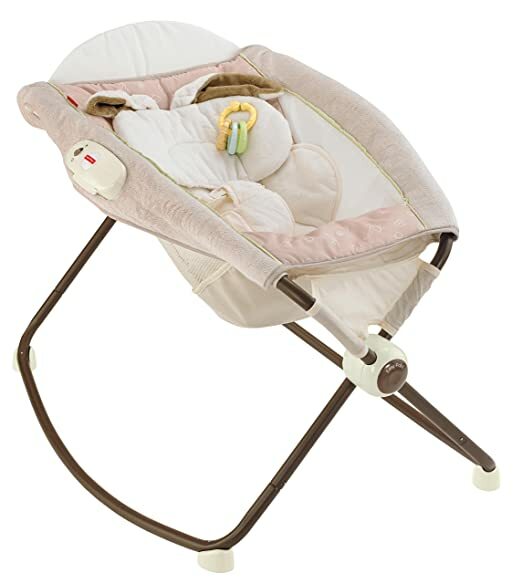 It keeps the baby safe in a small rocker by the bed, and it folds up nicely when not in use. I have many memories of B just sticking her toe out of the covers to rock a crying kiddo back to sleep. This particular model does well to not tip over. We also never used the vibrating effect. We found the older kids would turn it on more often than we ever did. Hope these items help you on your quest to raise a bitty human.